I learnt to make this daal from my mother. I love this daal and eat it with rice, chapatti, roti, idli and dosa. I sometimes just pour spoonfuls in my plate and lick it with a finger, that's how tasty it is.. really!! It is even more tasty when the tamarind is substituted with raw mango for sourness. 1. Wash both the daals and keep aside. Soak Tamarind. 2. In a pressure cooker, add the daals, sliced tomato, sliced onion, 4 garlic cloves, 1/2 Teaspoon cumin seeds, Fenugreek seeds, turmeric powder and water just above the ingredients. 3. Pressure cook for 4 whistles on medium high flame and 4 more whistles on low flame or for 10 minutes. 4. Let the pressure release on its own. 5. Grind the daal mixture to a coarse paste once it cools down completely. 6. Extract juice from the tamarind and add it to the daal. 7. Add chilli powder, coriander powder, coriander leaves, 10 curry leaves and water to thin down the daal as per the consistency required. I prefer it neither too thick nor too runny. 8. Mix it well and place it on high flame till it comes to a boil. 9. Reduce the flame to low and cook it for a further 10 minutes till the raw smell and taste of both chilli powder and tamarind disappear. 10. Just before the daal is done, heat oil in a saucepan. Crush the 4 garlic cloves. 11. Add whole red chilli and crushed garlic cloves to the oil. 12. 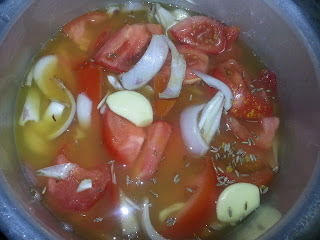 Next add chopped onion followed by mustard seeds, 1/2 Teaspoon cumin seeds. 13. Dont let the garlic or the onion burn. Just let it turn brown. 14. Add curry leaves and mix well. 15. Pour this over the daal and switch off both the flames. 16. 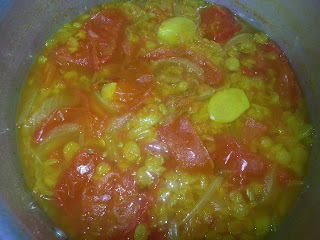 Immediately cover the daal to retain the aroma.